It will be the third attempt of AIBA to show in front of IOC’s highest governing body how clear and transparent the organization is. The first one was made in January 2017, when the leader of the boxing body was still Ching-Kuo Wu. He wrote a letter to Thomas Bach after a 4-month inquiry by so called AIBA’s Special Investigation Committee (SIC). “Key findings showed a lack of procedural forms which resulted in a concentration of decision making power and assignment of roles by former senior management which had a detrimental effect to in-competition good governance. Actions were swiftly taken to identify those involved”, wrote AIBA to Thomas Bach. During Rio Olympic in 2016 AIBA’s executive director Karim Bouzidi was cut from his operational control alone with the most experienced judges, who got the highest possible rank, 5-stars. They became known as The Magnificent Seven and controlled the education, selection and evaluation of the other elite officials. The controversial scoring of boxing bouts in Rio forced AIBA to form the SIC. Documents, sawn by Bulgaria Today” and “Le Monde”, revealed that Karim Bouzidi and 5-star R/J were the main suspects. During the investigation many proofs showed shady practices from the high level officials. The referee Ming-Li Lue even sent a letter to the president of AIBA Wu a letter, where stated that 5-star R/Js “extended pressure on 3 star officials to score bouts more in line with five stars”. The Executive director of USA Boxing Michael S. Martino wrote another testimony to SIC. He expressed an unusual conduct by Bouzidi. Right after the win of USA’s boxer Nico Hernandez (49 kg) at the quarter final Martino met the AIBA executive director. “Karim leaned over and whispered into my ear “you owe me a thanks”. I took his statement as to meaning, that he had helped Nico Hernandez secure the victory”, wrote in his letter Martino. The SIC’s final report, that didn’t reach IOC, concluded “that mechanisms were in place for Executive director to control event outcome”. However they didn’t find credible evidences of such practices. In fact Karim Bouzidi refused to testify in front of the investigators. According to SIC’s final report the Executive director had the power to determine who would referee and judge the events, who will work at the draw commission, tasked with the selection of officials for each bout, and who will be the supervisors for major events. “He (Bouzidi) could have used that authority. Could that have happened? Yes, under the authorities that he had. Did it happened? I have no evidence to say that happened”, resumed in interview to “Le Monde” and “Bulgaia Today” Tom Virgets, the chairman of SIC. A source told that the price of qualifying a boxer at Olympic final was $250 000. He was in a direct negotiation with one of the 5-star R/J and even recorded a phone conversation with him during the Games in Rio. According to the rules it’s forbidden to all the competition referees to discuss the event. The video/audio record was before the semifinal at 64 kg division between Sofiane Oumiha (France) and Dorjnyambuugiin Otgondalai (Mongolia). The name of Karim Bouzidi once again appeared in another incident that took place during the World championships in 2015, which served as the first Olympic qualification for Rio. A referee from China Dexin Wang went to the president of Cuban federation and member of AIBA Executive committee Alberto Puig with a dirty proposition. He led high official to a China trainer, where a proposition has been made. The Cuban star fighter Josvany Veitia should loss his semifinal bout at 52 kg division against China’s Hu Jianguan for $20 000. The winner of that fight would win Olympic quota for Rio. The China coach and the referee Dexin Wang were kicked out of the competition, but few months later the same official, who was part of offering a bribe for Olympic quota, once again was nominated and worked on another Olympic qualification in Baku, Azerbaijan. One more testimonial appeared in SIC’s files. The supervisor of World championships in Doha Pat Fiacco, a member of AIBA Executive committee and president of Boxing Canada recalled flagrant situations in a letter to Ching-Kwo Wu. He mentioned how Karim Bouzidi “gave directions to the 5 stars (R/J) on decisions of bouts”. The current president of French boxing federation Andre Martin confirmed the influence by Karim to the officials. “Bouzidi was naming the referees by himself”, said Martin. Three current French boxing officials met these last months admit they felt like France was among the countries protected by their countryman. “It is an open secret within French boxing “, said one. Ching-Kwo Wu felt the same, as he ordered Tom Virgets to specifically look into the bouts of France and Uzbekistan. French boxing, who felt his boxers were robbed in Beijing Olympics and even more in London, had an historic high tally of 6 medals in Rio, including two gold for the now-married Tony Yoka (+91 kg) and Estelle Mossely (60 kg). Another AIBA high-ranked official, who was having an operational role in Brazil, also has its doubts.“I think two French boxers were fortunate I was not judging them in Rio”, said the source. Not only in AIBA do they think France had some favorable decisions. In December 2016, during the Youth world championships, a French coach complained to the tournament supervisor after one of his men lost a fight. “We used to have better luck when Karim Bouzidi was executive director”, said the coach. His words were transmitted to the investigation committee. No French boxer was involved in a scandalous decision in Rio. “But all close bouts were ours”, says a member of the Federation with a perfect knowledge of the Olympic boxing and its refereeing. After the London Olympics, where France got zero medals, a strategy of influence was adopted within AIBA. It involved putting representatives in key commissions and adhere to AIBA’s side projects, APB and WSB. France did not have as much money as Kazakhstan, China or Azerbaijan, who financed the competitions, but through its former Olympic champion Brahim Asloum, turned promoter, it promised to launch a WSB team after the Rio Games. The first one was shut down in 2012 for financial reasons. There, as a president, he was working with M. Bouzidi, manager, and Kevinn Rabaud, head coach. Four years later in Rio, one was executive director of AIBA, one was heading the APB commission (Asloum) and another one the French boxing (Rabaud). Kevinn Rabaud, now working in French gymnastics, says the strategy was meant to avoid such unfair treatment as he felt was given to France in 2008 and 2012. The federation also used the image of the ”golden couple“ – Tony Yoka and Estelle Mossely, and sold their marketing value to AIBA by fostering media reports. “We made sure every story about them went to AIBA. It served the project as a whole and once we were at the Games, on that front, everything was ready”, says a main actor of this strategy. Many things changed after Rio events, but some of the players are the same. The long time AIBA president Ching-Kwo Wu was kicked out of the organization after quite revolt. He was suspended by a Disciplinary commission, led by Tom Virgets, who later was promoted to AIBA Executive director. The new president Gafur Rakhimov was elected in November during the congress in November. IOC didn’t like the results. “Gafur Rakhimov’s designation as a key member and associate of a transnational organized criminal network by the US Treasury Department creates uncertainty about his role as President of AIBA”, said in a Statement IOC. According to couple of sources Rakhimov had a powerful lobbyist behind the scenes during the AIBA elections, named Karim Bouzidi. “I am pretty sure Bouzidi is working for Gafur, because he helped us set up the candidacy for an Olympic qualification tournament”, confessed the president of French boxing federation Andre Martin. “If he is lobbying for Gafur Rakhimov, I think he is doing it on his own accord. I am not aware if Mr. Rakhimov is paying him”, added Tom Virgets. The Frenchman once again worked openly in Olympic boxing as he was seen last year discussing the current activities with a smile on his face with the person, who investigated him Tom Virgets. 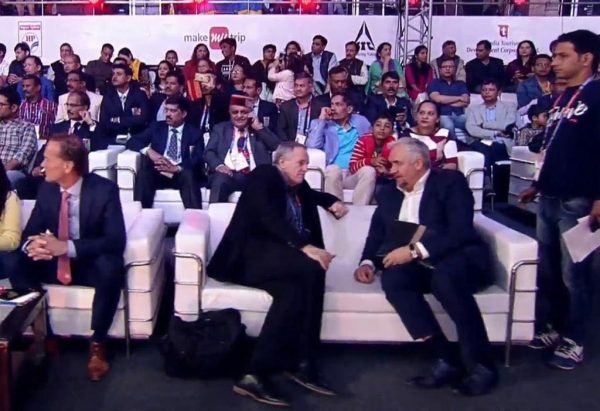 Virgets (left) and Bouzidi (right) are having a conversation during World Women championships in New Delhi. “I have talked to him at times but the conversation is cordial, it involved professional boxing”, said Virgets. Karim Bouzidi made a try to stay in AIBA thanks to a company “Versus Data Sports, registrated to his partner Benoit Giran. Both are working together in another project for managing professional fighters “Versus Sports Group”. One of them is the star Heavyweight Filip Hrgovic. 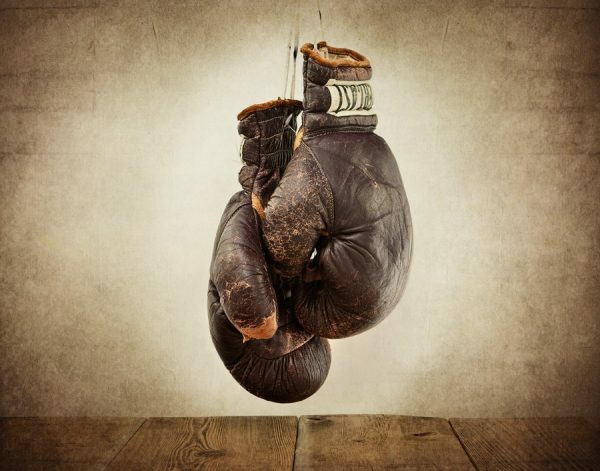 A presentation was made in front of AIBA Executive committee in February for a gloves sensor technology that could collect important data as the power and speed of the punches. It was commissioned by the president Gafur Rakhimov, according to the minutes of Executive committee meeting. Few days later a new technical and competition rule was added. “In all AIBA-owned and AIBA-sanctioned Competitions, boxing sensors manufactured by the AIBA Official Data provider/partner shall be allowed to be worn in order to gather Competition and boxing data/metrics”, says the new rule. Tom Virgets confirmed that Versus data sports presented their project. “They have come to us, they did a presentation and the company is interested in doing some research with AIBA. It’s very intriguing to me”, said Virgets. Karim Bouzidi was approached for comments, but never returned answers to “Le Monde” and “Bulgaria Today”’s questions. Just six days before IOC’s decision on the future of Olympic boxing Gafur Rakhimov stepped aside as a president of AIBA. He probably will be succeeded by another main player from Rio Games – the Moroccan Mohamed Moustahsane. The African was proposed by AIBA’s Executive committee members to become the interim president. Officially his assignment should be voted in the next few days. During Rio Olympics Moustahsane was appointed as the chairman of the draw commission, tasked with the selection of the Referees and judges for each bout. Posted on March 25, 2019, in boxing and tagged AIBA, IOC, Karim Bouzidi, Rio Olympics. Bookmark the permalink. Leave a comment.